From the moment you walk through the doors into our reception area, we want you to know you have just stepped into a special place. A place designed to ignite and inspire your passion for Pole Dance and fitness! Diamond Class is not just a space to come to and learn pole dancing, but it is also an exceptional community of inspiring, friendly and extremely talented like minded individuals and when you sign up for a class you are signing up to join and be apart of our amazing community! Are you ready for a ‘Pole’ new you? Great! You don’t have to wait for the new Term to start, get started right now with one of our casual class pass options! Head over to our Pole Packages and Pricing page and lets get you booked into one of our 8 week Pole Dancing Courses today! Whether its Pole Dancing, Fitness, Dance or Flexibility! Diamond Class Pole & Fitness Studio has classes for you! To check out the full range of casual classes and pricing head over to our Casual Classes Page or for a full up-to-date schedule head to our Interactive Timetable. Don’t forget to like and follow us on facebook and instagram! 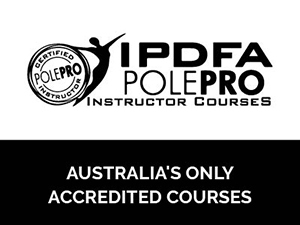 Diamond Class Pole and Fitness Studio is the only place in Tasmania you can learn from accredited pole instructors with IPDFA PolePro qualifications – the only officially Accredited Courses in Australia. IPDFA PolePro Instructor Courses are Internationally Recognised, Endorsed in USA and UK and Accredited through Fitness Australia with 15 CEC points. Want to join a course? or have a Question? Ask us! Would you like to join our mailout list to get all the latest on what's happening at the studio? What's the Latest News at Diamond Class? HAPPY EASTER EVERYONE! A fun photo from last nights outdoor pole shoot with @neil.photo Some aggressive Easter egg eating going on here #easter..
A beautiful photo we had to share from one of our Diamonds ‘Danielle’ practicing for our In House Student Comp SHINING DIAMONDS on May 18th! Check out this photo of one of our amazing instructors ‘Louise’ performing at a Circus show in Devonport last weekend! #performance #poledance..